The rocket was supposed to be operational by the end of 2016. While NASA is officially “fully committed to the Space Launch System,” it may “eventually retire” the expensive mega rocket system once private companies successfully bring their rockets online. That means if Elon Musk’s SpaceX or Jeff Bezos’s Blue Origin or United Launch Alliance, or any other private aerospace firm can get its own rockets ready faster, the SLS may have a short shelf life. At The Economist’s Space Summit, NASA confirmed that the possibility of one day retiring the SLS if other commercial launch vehicles become available isn’t off the table, as reported by Business Insider on Friday. With costs ballooning to $24 billion from its original $18 billion estimate in 2011, combined with multiple delayed launch dates, the idea for NASA to cut its losses and focus on smaller targets may loom closer, leaving Blue Origin’s New Glenn and SpaceX’s Big Falcon Rocket vying for the spotlight. 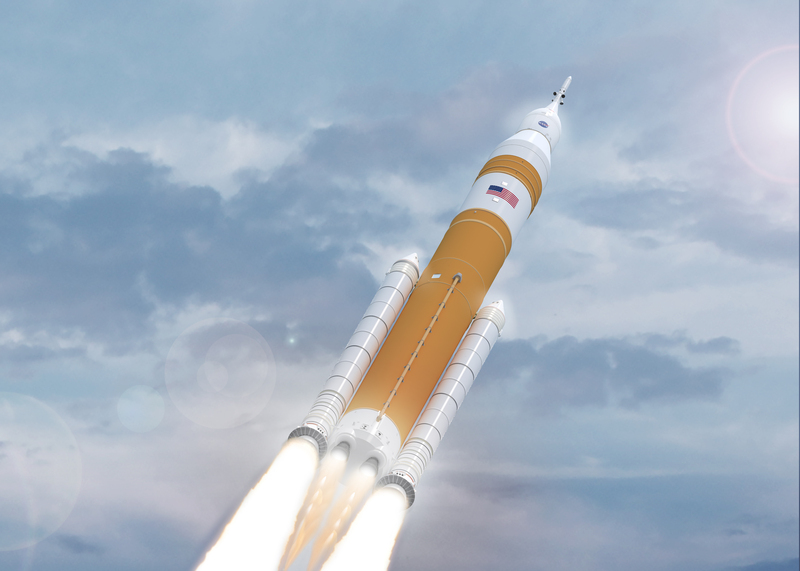 In an alternate universe where NASA’s original plans go exactly as stated, the SLS would have achieved operational status by December 31, 2016, following the project’s legal birth from the NASA Authorization Act in 2010. NASA envisioned the rocket as a super heavy launch lift vehicle (a launcher that can carry a payload over 50 tons) that would take a multipurpose crew to low-Earth orbit (LEO). Thanks to a series of complications, including delays from the ESA’s contribution creating the module and a tornado hitting Michoud Assembly Facility in February 2017, the 322-foot SLS in this universe is scheduled for test launch in June 2020 as part of Exploration Mission-1, which will take the uncrewed Orion capsule on a joyride around the moon and back, pushing NASA’s goal to launch a crewed mission to somewhere in 2023. Compared to its main competitors, Blue Origin’s New Glenn and SpaceX’s Big Falcon Rocket, the single-use SLS comes at an exorbitant price. New Glenn's 7 meter fairing gives it a higher volume of payload than other vehicles in its class, which typically measure up to 5 meters. Amazon giant Jeff Bezos invested a “mere” $2.5 billion into the two-stage, 95-meter tall New Glenn, which has a fully reusable first stage, designed for 25 uses. With its 45-metric-ton payload capability to LEO, the rocket doesn’t quite make the cut as a super heavy launch lift vehicle, but this hasn’t stopped the the US Air Force from awarding Blue Origin $500 million for New Glenn’s development in October. Its debut launch is slated for late 2020. BFR, illustrated above, is designed to be completely resuable. SpaceX already has experience reusing rockets, as demonstrated with the Falcon 9. The even-more-ambitious, 100-percent-reusable Big Falcon Rocket (BFR) created by Elon Musk’s SpaceX is also a two-stage rocket, with the entire system (spacecraft and booster) standing at 348 feet (106 meters). With 40 cabins to carry 100 passengers and a 150 ton payload to LEO, BFR’s design steadily plods toward Musk’s dream of establishing a Martian settlement. Although Musk’s roadster has already headed toward Mars, SpaceX plans to start launching suborbital “hops” in late 2019, followed by launching cargo ships to the red planet in 2022, priming the company for crewed missions by 2024. NASA doesn’t anticipate sending crewed missions to Mars until the 2030s. Previous administrators have proposed ditching the SLS, including the former Deputy Administrator of NASA, Lori Garver, who felt the mission leaned too heavily on past strategies. Assistant Associate Administrator Bill Hill saw operational issues in 2016: “We’re just way too expensive today,” Hill told Ars Technica. Collaborating with commercial endeavors like SpaceX may already be on the horizon, though the question of who draws the path will be answered, one rocket at a time. Despite the SLS’s single-use drawback and slow progress, the rocket is undeniably powerful. So it makes sense that NASA will continue to develop its own government-made heavy-duty rocket. If one or more private industry efforts goes kaput, it will have the SLS around. But the day NASA seeks a semi-graceful out from its powerful, expensive rocket, Blue Origin and SpaceX will be waiting.